Kaneko Sangyo has just developed a portable toilet known as Kurumarukun that can be used inside a car, concealing the user from curious eyes with the help of a curtain. This toilet requires the user to assemble a cardboard toilet bowl (can it actually be strong enough?) 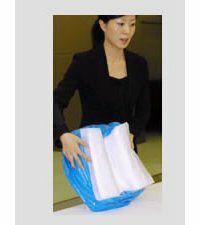 that holds a water-absorbent sheet within. You can set this toilet on the back seat of a car while the plastic bag can be sealed tightly once you’re done with your “business”, so make sure you dispose of it properly. This portable toilet will definitely be a lifesaver whenever you’re stuck in rush hour traffic. It retails for approximately $41 when released in Japan this November 15th. Finally! Now I can do away with the astronaut diapers.